HF: Our article, Tung Tai Tseung Kee & Company, 同泰祥記, engineers and shipbuilders, 1897 to c1945, mentions “The proprietor of the firm, Mr Lan Fat, was born in San On Province, China, received his education in Hongkong, and was afterwards apprenticed as a draughtsman to Messrs. Fenwick & Co. for nine years. Stephen Davies: A.R. 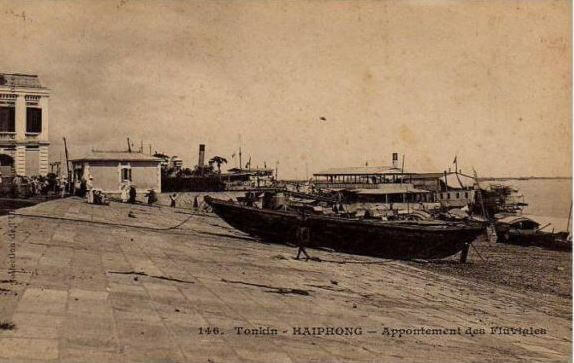 Marty & Co were owners and managers of the Compagnie de Navigation Tonkinoise (working HK to Haiphong) – also A.R. Marty & Co – and a couple of French Indo-Chinese river transport outfits. It turns out the latter were almost certainly the pioneers of stern-wheelers on rivers, so their designs maybe influenced Fenwick’s production of the same for Swire. Sadly all their primary documentation has been lost, so all that remains is secondary source material. Their shipyard (in Haiphong) was Marty et D’Abbadie, armateurs-constructeurs-mécaniciens – Jules D’Abbadie, who was mainly based in Hanoi, but frequently visited HK, had a sister called Clémentine who fell in love with the Brit engineer in charge of installing the new Peak Tramway’s braking system, James Rebbeck. They married in HK a week before the Peak Tram was commissioned in 1888, later moving to Vancouver. A. Pierre Marty, who died in HK in 1909, was resident here (and in his latter years Spanish Consul) from his arrival, aged 17, in 1871, to work for his brother Auguste Raphael Marty (who also lived in HK until he moved to Haiphong in 1906 where he died in 1914), who founded the company (A.R. Marty & Co.) in 1874. The Marty shipping line was founded in 1882 and as far as I can work out stayed in business until it was sold to P.A. Lapicque & Co (by the successor to A.R. Marty, one Rene Salle) on 12th Feb 1918. I think for a short while it may have operated as Marty-Lapicque, but by 1919 was certainly only Lapicque. Paul-Augustin Lapicque, also an HK resident, is another of the very interesting members of the small number of Frenchmen in HK’s shipping biz from the 1870s through to WW2. In April 1911 the Marty steamer Hongkong became the first of the coasting fleet working out of HK to be fitted with the new fangled wireless radio (a year before the Titanic disaster to boot). The Lapicque owned and operated Compagnie de Navigation Tonkinoise was liquidated in 1938, unable to succeed in an increasingly harsh operating environment. This article was first posted on 18th May 2017.